Waka Flocka Flame, the artist responsible for the hit song "No Hands," is appearing with no clothes as the star of a series of ads for People for the Ethnical Treatment of Animals. 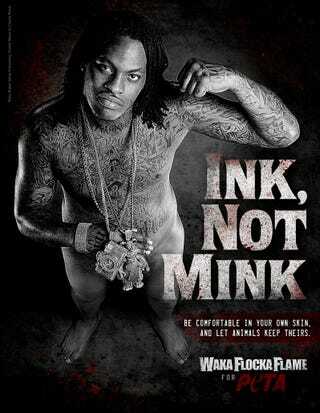 In one, under his naked (except for a very carefully placed giant necklace) tattoo-covered body, the poster reads, "Be comfortable in your own skin, and let animals keep theirs." Another says, "F—- Fur." There's also a "tame" version, shot from a different angle and made decent by itty-bitty boxer briefs instead of dangling bling.